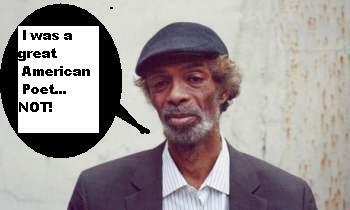 Gil Scott-Heron – dead at 62. Home → Damien Zone → Gil Scott-Heron – dead at 62. He was known as “the godfather of rap” –the music that downgraded American culture and taste. He composed the 1974 compilation album, “The Revolution Will Not Be Televised”. The poet, ( yawn) musician and author Gil Scott-Heron died Fri. at 62, according to his U.K. book publisher, Jamie Byng, who made the announcement via Twitter. Lisa Gottheil, a publicist for Scott-Heron’s label, XL Recordings, confirmed via email that he died Fri. at a New York City hospital. A friend who answered the telephone listed for his Manhattan recording company confirms he died Friday afternoon at a hospital. Doris C. Nolan says he died after becoming sick upon returning from a European trip, but Wikipedia reports that He was HIV positive for many years. Born in Chicago on April 1, 1949 and raised in Jackson, Tenn., Scott-Heron’s spoken word pieces in the 1970s was a great influence on what would later become the genres of hip-hop and neo-soul. Often incorporating activism in his work, Scott-Heron performed at the No Nukes concert at Madison Square Garden in 1979, to protest the use of nuclear energy following the Three-Mile Island catastrophe in Penn. Of course he had no idea what he was talking about but at the time it seemed like the cool thing to do . Scott-Heron was arrested for cocaine possession, sentenced to one-three years imprisonment in 2001 and released on parole in 2003. He was basically a dope addict and a self-proclaimed poet. This is how you get famous in America. In 2010 The Nation , the most liberal and silly, stupid, made-for-misfiits rag newspaper in the world,named his song “We Almost Lost Detroit” as one of the greatest songs of the century and one of the “Top 12 Most Patriotic Songs Ever” –do you wanna laugh? I know I do. He mixed minimalistic percussion and spoken-word performances tinged with politics in a style he sometimes referred to as bluesology. He recorded more than a dozen albums and wrote a handful of books — which nobody has ever read except in inner city schools where they don’t understand it anyway. The highly-respected artist inspired many in the music industry, from Common to Kanye West – regular Irving Berlins and Cole Porters. More recently, Kanye West sampled Scott-Heron’s voice for his 2010 album “My Beautiful Dark Twisted Fantasy”. Jeff Conaway had Sepsis. What is Sepsis? Jeff Conaway Dead -- Why Did Dr. Drew Pinsky Tell Two Stories?